Naturopathic medicine is a distinct primary health care system that blends modern scientific knowledge with traditional and natural forms of medicine. It is based on the healing power of nature and it supports and stimulates the body’s ability to heal itself. Naturopathic medicine is the art and science of disease diagnosis, treatment and prevention using natural therapies including: botanical medicine, clinical nutrition, homeopathy, traditional Chinese medicine and acupuncture, and prevention and lifestyle counselling. The primary goal of naturopathic treatment is to address the cause of the illness rather than simply treating or suppressing symptoms. 2. What conditions can a Naturopathic Doctor treat? Patients that have been diagnosed with an illness, often serious or chronic, and are looking for alternative treatments. Naturopathic medicine is very effective for improving quality of life for those with serious and life threatening illnesses. 3. Is there coverage for Naturopathic Medicine? Most extended health care insurance plans have naturopathic coverage. We encourage you to look into your own healthcare plan to see how much coverage it provides. After you pay for your visit, we will provide you with a receipt that can be submitted to your insurance company for re-imbursement. NDs are not currently covered under OHIP. 4. Do I need a referral to see a Naturopathic Doctor (ND)? No, you do not require a referral to see a Naturopathic Doctor. 5. What is the training process to become a registered Naturopathic Doctor in Ontario? NDs require a minimum three years of pre-medical postsecondary education, plus four years of full-time study at an accredited school of Naturopathic Medicine. This four year program incorporates over 4500 hours of classroom training in basic medical science courses, clinical sciences and naturopathic therapies, as well as 1500 hours of supervised clinical experience. Following the completion of their program, NDs must successfully complete the Naturopathic Physicians Licensing Examinations (NPLEX) in order to qualify for licensing in Ontario. NPLEX is the standard examination used by all regulated provinces and states across North America. Naturopathic Doctors are the only regulated health professionals in the field of natural medicine in Ontario. Naturopathic Doctors are regulated in Ontario under the 1925 Drugless Therapy Act and are registered (licensed) by the Board of Directors of Drugless Therapy-Naturopathy (BDDT-N). The BDDT-N functions to ensure that Naturopathic Doctors are properly qualified to practise Naturopathic Medicine and that they follow the appropriate standards of practice. 7. What should I expect during my initial visit? An initial intake form consisting of questions about your health concerns and medical history will be completed prior to your first visit. We also ask that you bring any medication, supplements and copies of any recent blood work to your first appointment. Your first visit will be up to 75 minutes in length and will consist of questions pertaining to your concerns and a thorough health history. A physical examination will be performed if needed. Further testing such as blood work and/or specialized diagnostic tests may be recommended. With your input, your ND will propose a personalized treatment plan to help you achieve your health goals. 8. How often I am required to come for a follow up? A follow-up appointment is usually scheduled within a month after your initial consultation. This allows your ND to assess the progress of the treatment protocol and answer any questions that may have arisen. The frequency of Naturopathic visits varies from person to person and will depend on what you are being treated for, the severity of your symptoms and your initial response to treatment. Follow up visits are generally more frequent at first and taper off as your health is restored. 9. Will my medications interact with what a Naturopathic Doctor prescribes? NDs have extensive training in Pharmacology. They understand the interactions between medications and natural therapies. NDs can safely prescribe natural treatments that increase the effectiveness, and reduce the side effects from prescription medications. NDs are often able to eliminate the need for some medications by offering other viable treatment options. 10. What is the difference between Naturopathic Medicine and Homeopathy? Naturopathic Doctors are general practitioners of natural medicine and Homeopathic medicine is just one of the many therapies that NDs may use to treat conditions. NDs are trained to treat ailments using clinical nutrition, acupuncture, botanical medicine, lifestyle counselling and homeopathy. So, while a Homeopath would prescribe a homeopathic remedy, a Naturopathic Doctor would use any of the approaches listed above, including homeopathy, in their treatments. Some NDs use very little or no homeopathy in their treatments. 11. Do you offer phone or email consults for people who live out of town? Yes, we offer both phone and email consultations to all of our patients, whether they are living out of town or not. To book an appointment at Healthy Foundations Naturopathic Clinic, please call 705-243-5163 or email us at info@healthyfoundations.ca. 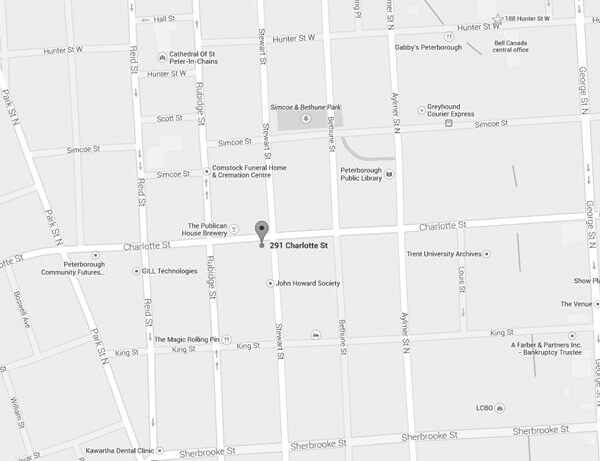 We are located at 291 Charlotte Street, Peterborough, ON. Please download our patient intake form and fill this out prior to your visit.